Skating plays a huge role in Detroit’s cultural and political history. In 1950s and 60s Detroit, during what would have been the beginning moments of the cultural shift brought on by desegregation, roller-rink owners maintained racial divides by violently pushing ‘Rhythm Nights’ and ‘Soul Nights’ to African-Americans. Attendance was enforced by means of harassing and attacking the black populous if they showed up to other events. Through brute force, these nights came to be symptomatic of the style and culture of black popular music, which was in direct opposition to the organ music and rigid circular skating formations of the white skate counterpart. Kenny Dixon, Jr AKA Moodymann has long been a favourite of NTS residents, and NTS are no stranger to collaborating with Carhartt WIP. It makes sense that all three, with Dazed, have partnered to release a sensitive portrayal of one of Detroit’s lasting subcultures. First starting skating as a child, Moodymann’s return to the roller rink was as an adult, lured in because “The skatin’ enthused [him]… but the women in there was incredible.” The rink has become somewhat of an alter, welcoming the ardent congregation of the church of skate. Since 2007 Moodymann’s Soul Skate has hosted a biannual event that encourages slick wheeled, footwork aficionados to express themselves on the wood. “Lay your problems on the wood” one skater announces during the film. Whirling, dipping dancers on wheels fill the screen as we’re transported to Detroit, to the rink. The film wistfully portrays the tapestry of voices that come together to make Soul Skate an event that calls to people from around the world. “For one night only everyone’s from the same place and that’s skate” intimates Moodymann. The joining together of different collectives and regions are an example of the purity of language found in movement. Different movements form linguistic patterns that become an intrinsic part of a state or country’s identity. From Jersey, ATL, and London, it’s an identifiable marker of who you are under one body. Founded in 1889 Detroit, Carhartt Inc. was and still is a workwear staple. Created with functionality at its core, it’s lasting influence, like much of Detroit’s, has come through the musicians that donned it, that gave it longevity in mainstream streetwear culture. Carhartt WIP’s ardent support for musicians even led them to creating a record label that released a Moodymann 7” in 2016. Spawning more than 5 generations of musical legacy, the Motor City’s undeniable grip of song allows it to tell the city’s cultural, spiritual, and political story of survival like no other. 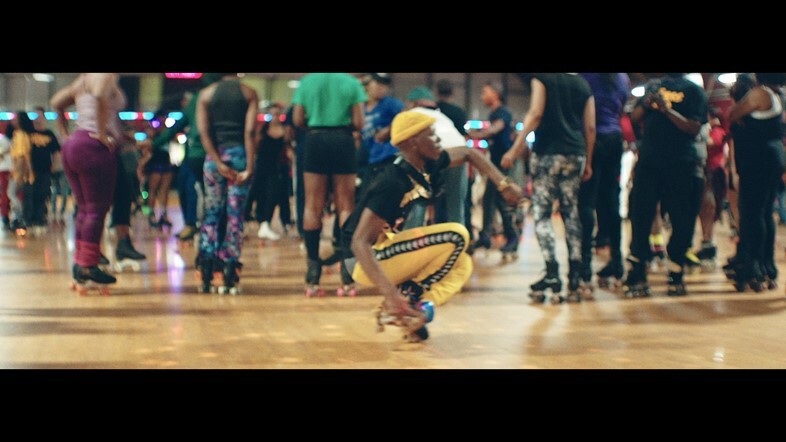 Soul Skate has fostered some incredible music acts and celebrated offerings from more established practitioners – Detroit’s Soul Skate is one of the few skate parties in the US to feature big acts like DJ Ouik for people to roll to. Disco, Soul, Funk, and Hip-hop all continue to share fame on the rink. “Skate never left… it’s just that y’all seeing it now” is a prescient reminder that Detroit’s Soul Skate may be one of America’s few lasting subcultures. The city’s heart is one that has an irremovable grip on sound and movement. There, under the lights, united in one community space, driven all by the same passion, Skate finds its home and brings together different families. Director Ramone Anderson, director of photography Adam Rock, camera assistant Sean Mouton, sound recordist (Detroit) Celeste Robinson, Kelli Tynan, sound recordist (UK) Morgan Williams, producer Nyah Clarke, executive producer (Dazed) Thomas Gorton, executive producers (NTS) Sean McAuliffe, Femi Adeyemi, executive producer (Carhartt) Michael Leuffen, Philipp Maiburg, editor Nikolaj Belzer @ Okay Studio, colourist Ludovic Roussaux @ Okay Studio, online editor Faris Hallaq, post-production coordinator Honor Page, Rose Nicholson @ Okay Studio, sound designer Morgan Williams, graphic design Rory Gleeson, motion graphics Marianne Wilson. Music “Tribute”, “Black Mahogani”, “MahoganyBrown”, “Music People”, “I Got Werk”, “I Can’t Kick This Feeling When It Hits”. Written and Produced by Moodymann. Courtesy of Mahogani Music. Special thanks to KDJ, Jr., Traci Washington, Flo Real, Team Soul Skate, DJ Mz Tone, Annie Hall, Marisa Brickman, Tamsin Weir, Allison Gordon-Parry, Tabitha Thorlu-Bangura, Chantal Adams, Jon Moy, Stratton Camera, Jamie McCubbin, Okay Studio, Truce Susan, Josh Roberts, Holly EM, Detroit Roller Wheels, Northland Skating Rink, Bonaventure Skating Rink, Bert’s Warehouse & the City of Detroit.